On May 1, 2014, we, California inmates who have been in solitary confinement for long periods of time based on “validation” as alleged associates or members of gangs, rather than based on any violent behavior, serious rule violations, or crimes while in prison, co-signed a letter addressed to the California Senate and Assembly expressing our grave concerns with Sen. Hancock’s SB 892. We wish to follow up on our previous letter, as SB 892 has now been approved by the Senate and is being considered in the Assembly. Pelican Bay prisoners express with their art the pain they are made to suffer daily and their conviction that it is profit-driven. CCPOA, the guards’ union, acknowledged as the most powerful lobby in California, recognizes segregated – or solitary – confinement as a relatively safe and extremely lucrative assignment, with generous overtime. With CCPOA’s support, California segregates more people than any other prison system. The bill should eliminate the use of gang validation and minor rule violations as a justification for placing inmates in SHUs. As it stands currently, SB 892 does not eliminate SHU assignment for mere gang association and it does not eliminate indeterminate SHU terms. This is a critical issue and one of our core demands. The nationwide trend is clearly not to place prisoners in segregated housing units for alleged gang association without accompanying serious rule violations. Numerous states have moved in this direction for public safety reasons, for humane reasons and to cut costs. California should not now move in the opposite direction. During assessment for SHU placement, the use of testimony of an in-custody informant should be corroborated by an independent source not based on hearsay before being relied upon to place someone in a SHU. This is the same principle now applied in criminal court cases since state law was amended in 2011. Prisoners facing the drastic consequences of being placed in a SHU should be entitled to the assistance of counsel, even if at no cost to the state. Pro bono counsel could in many cases be identified to assist prisoners charged with something that may result in being given a long or indefinite term in a SHU. The “matrix” CDCR uses to place prisoners in the SHU as alleged gang members is entirely unrelated to serious misconduct, alleged leadership of a dangerous gang, recruiting gang members to engage in gang violence etc. The “matrix” that SB 892 would adopt into state law has nothing to do with the co-called “worst-of-the-worst” alleged gang members. The “matrix” allows CDCR officers to place prisoners in solitary confinement because of books, photographs and holiday postcards they possess, because they “associated” with a gang member (which could mean a conversation or simply exercising together), for having a tattoo which could be 10 years old, because a co-defendant at a trial years ago was a gang member etc. The criteria in the “matrix” have nothing to do with a prisoner engaging in serious wrongdoing or even planned wrongdoing. Under the “matrix,” if CDCR had the space available, it could probably place about 75,000 prisoners who may be validated as gang members in SHUs. Pelican Bay is notorious worldwide. 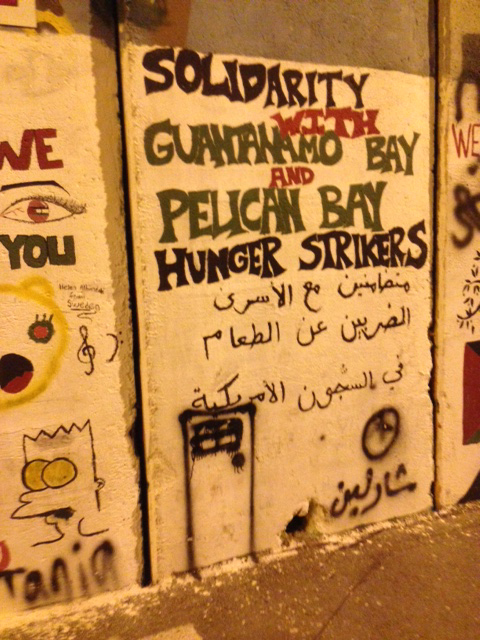 This message from Palestinian hunger strikers is painted on Israel’s apartheid wall in the little town of Bethlehem. We do not believe that the range of provisions in SB 892 related to review by the Office of the Inspector General of cases in which SHU placement is based on the testimony of a confidential informant, the appointment of ombudsmen, the requirement for a weekly “face-to-face” encounters with CDCR employees, the appointment of an “advocate” for an inmate being processed for SHU placement, or the Step Down Program in SB 892 will make any measurable difference in CDCR solitary confinement practices. The Inspector General is unlikely upon review of a file to reverse CDCR decisions based on confidential informants. Ombudsmen will be of little value as long as inmates can be placed in SHUs for alleged gang association when they have engaged in no wrongdoing. Weekly “face-to-face” encounters already happen almost every day when our food is served or a psych tech walks past our cells. Allowing an “advocate” to assist in the SHU assignment process will most likely mean assignment of a guard who could care less about the result. And the proposed Step Down Program focuses on forcing prisoners to disavow alleged gang association rather than on a behavior-based model considering whether the prisoner has violated rules while in the SHU. Despite these misguided and costly provisions in SB 892, we would support the bill if it were amended to include the three recommendations identified above. We are aware of no hard data CDCR has ever produced for review by the public, by prisoners or by experts showing that the decades-old gang validation program works, or that it has reduced gang affiliations, facilitated gang truces or reduced prison violence. Nor has CDCR ever provided data showing that California is somehow unique and, unlike other states, needs a sledgehammer gang validation policy. If SB 892 is not enacted, further legislation could be considered in the next legislative session after CDCR data is collected by the legislature and through a now-pending Public Records Act lawsuit several of us have joined as plaintiffs. Thank you for considering our comments and suggestions.